B Engineering is a small-volume automobile manufacturer located in Italy. It is made up of several former employees of the Bugatti firm when it was under the leadership of Romano Artioli. 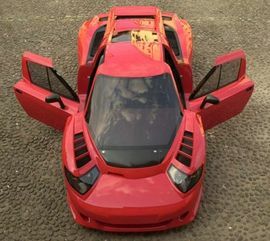 B-Engineering is the company behind the superexclusive Edonis supercar, based on the Bugatti EB110. Thanks to severe engine modifications it has higher performances than it's 'basevehicle'. In addition, the 4WD triple-differential drivetrain from the original Bugatti has been replaced with a much simpler and lighter RWD transaxle, thus saving approximately 70kg from total weight. These power figures give the 1500kg Edonis a power-to-weight ratio of 480 bhp/ton. In addition, the engine's specific power output is an unprecedented 181 bhp/liter. The brand claims a maximum speed of 365 km/h (227 mph), while accelerating from 0 to 100 km/h in only 3.9 seconds. B Engineering plan to build only 21 vehicles from chassis originally built for Bugatti by Aerospatiale (Most of the remaining chassis delivered to Bugatti prior to their bankruptcy were delivered to Dauer Sportwagen when they purchased the assets of the company). The Edonis is expected to sell for around €760,000. On January 1st 2001 in Modena the first car of the 21st century was unveiled. Significantly, 21 units will be produced. As this work is committed to paying homage to creativity whether technical or aesthetic, each car will bear the name of a famous inventor or artist from each century. This car is the work of a team of engineers who have left their work on the history of GT and racing cars . Through this emblematic creation we wish to express and share with all enthusiasts our personal vision of the car. Furthermore, this is to be done within a context of great creative freedom made possible by the absence of commercial constraints. This achievement seeks to affirm that the car must remain a thing of creative passion, as well as an extraordinary human adventure. Its design is to be an invitation to pleasure-kind that gives the car its truly magic dimension, where aesthetic expression and technical emotion blend and mingle to fulfill a dream. How better to define the spirit, foundation and content of this project than by its name Edonis (from the Greek word meaning pleasure). its technical and aesthetic quest. Because innovation today necessarily requires reference to the huge body of knowledge of state-of-the-art technology, B.Engineering has opted to collaborate with leading companies. In fact, only the most advanced technology can respond adequately to this level of technical sophistication, as well as to the need for active and passive safety required by the performance level of such a car. The chassis, made entirely of carbon fibre, has been designed in collaboration with the Aérospatiale Matra Group (EADS-AIRBUS) who has taken on its construction. All test development and prototype tuning will be carried out together with Michelin, who will fit the car with its special Pax System tecnology tires. These will allow the car, in the event of puncture, to keep going for over 200 km. The state-of-the-art skills of these craftsmen in the manufacture of GT vehicles, as well as in F1 racing are the result of a tradition in prestige and an indisputed mastery in design and technology attributes which are a part of the living heritage of Modena. It is also a statement of their passion for car, the product of an outstanding environment which promotes the spirit of competition. In fact, these local GT manufacturers manage to produce as many prestige cars as all of their competitors put together. B.Engineering is committed to paying homage to the creativity of the Modena craftsmen- the body builders, designers, foundry workers, upholsterers- to their superb technical mastery and their artistic flair, and will therefore involve them closely in the Edonis project. The body of the car is to be entirely hand-made according to techniques unique to the master craftsmen of Modena. Castings, as well as the manufacturing of the 12 cylinder engine and its transmission, especially developed by B.Engineering for this project, is to be carried out in local work-shops by the same specialist companies. Assembly of the power train, transmission and of the car itself will be carried out by B.Engineering.